Automobile engines are spoken of as four-cycle engines. This is a shortening of the correct name, four-stroke cycle. 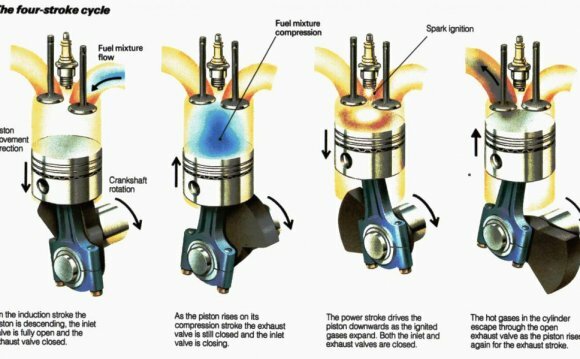 A stroke is one complete down or one complete up movement of the piston. There are two downstrokes and two upstrokes to a cycle for the internal combustion engine of this design. A cycle is a round of events, which occurs in a certain fixed order. There are four events in the automobile-engine cycle. These four events correspond to the four strokes. Thus we have the name, the four-stroke cycle, or the shortened and more used term, the four-cycle engine. On the first stroke of any cycle within an engine, the first event or operation is the drawing in of air and fuel through the carburetor. This occurs on the downstroke of the piston. The second operation is compressing or squeezing together of the fuel charge drawn in on the first downstroke. The compressing of the fuel occurs on the first upstroke of the piston. The fuel is fired at the end of this stroke, and the third event or operation is under way. The piston is forced downward on the second downstroke. On the second upstroke, it drives the burned gases before it, and they pass out of the cylinder. The order, then, of the four strokes of the cycle is this: First downstroke, intake; first upstroke, compression; second downstroke, power ; second upstroke, exhaust. The cycles occur as follows: Intake, compression, power, exhaust, again and again. Pistons are moved up and down on the strokes by the crankshaft throw. Each revolution of the crankshaft gives two strokes of the piston. For four strokes (two down, two up) the crankshaft must turn twice. The flywheel, attached as it is to the crankshaft, turns through two complete revolutions for each four strokes of the piston. This means, since there are 24 teeth in the crankshaft gear and 48 teeth in the camshaft gear, that the camshaft will turn half as fast as the crankshaft. The camshaft (left) carries two cams for each cylinder. It turns once for each four strokes of the piston. Each cam has a valve lifter resting on it. Each cam lifts the lifter resting on it, once for each full revolution of the camshaft. Each valve is thus lifted once for each four strokes of the piston or two revolutions of the crankshaft. The time at which each valve is lifted is called "engine or valve time." The intake valve (right) must start to open as intake (first down-stroke) starts. It must close when compression (first upstroke) starts. Both valves must remain closed during compression and power (first upstroke and second downstroke). The exhaust valve must open at the beginning of the exhaust stroke and remain open to the finish of this, the second upstroke. The intake valve opens on the first stroke to let the fuel charge in. The exhaust valve opens on the fourth stroke to let the burned gases out. While the four strokes of the piston are bound to be of equal length, it is not true that the same amount of piston travel is assigned to each stroke. As a matter of fact, there is a wide difference in the degrees of crankshaft travel of the four operations. There are 360 deg. to each circle. A flywheel turning twice will then travel through two circles, or 720 deg. This number of degrees is then divided between the four strokes of the cycle. The starting point for all figuring in engine valve timing is t.d.c. (top dead centre). This refers to the t.d.c. for the first piston in its cylinder. This position is often marked on the flywheel. What is the Difference Between 2-Cycle Oil & Motor Oil?